If you use GitHub Issues to track feature development, you’ll appreciate being able to push prioritized features straight from productboard. Your engineering team can continue managing their development pipeline in GitHub while product managers enjoy the flexibility of productboard for understanding user needs, prioritizing what to build next, and rallying everyone around the roadmap. Any change to these fields in GitHub will be reflected in productboard in real-time. 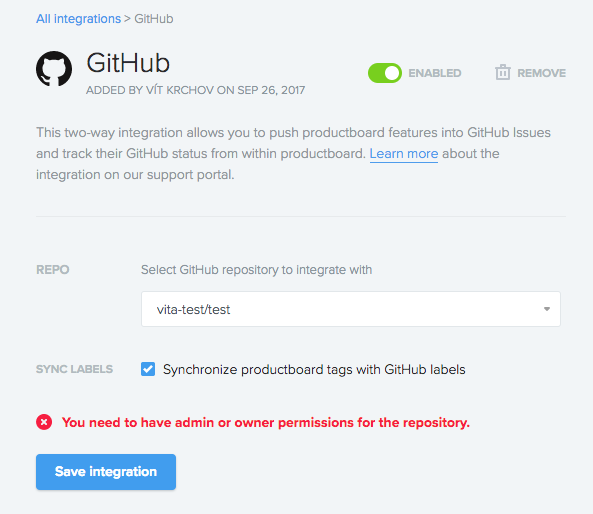 To set up the GitHub integration, users must have the admin user role in productboard and repository admin role in GitHub. From the accounts menu (lower left), select Integrations, then select the [+] icon beside GitHub. Use the dropdown to select the correct repository associated with your GitHub account. Decide whether feature tags in productboard should sync with GitHub labels. Select the feature or subfeature's name to open its details in the side pane. Beside GitHub select Push. Add the special GitHub task column to your board (using the column configuration bar at right). Select the Push button that appears alongside the feature/subfeature in question. All features and subfeatures pushed to GitHub become issues. It's possible to push subfeatures into GitHub without pushing their parent feature. When features/subfeatures are pushed to GitHub, the productboard URL will automatically be added to the issue. In productboard, you can click the task status of a feature that has been pushed to GitHub to navigate to that issue. If you have multiple GitHub repositories, you can create multiple integrations. For each integration, a new task column will automatically be created. Rename the field/column associated with each GitHub integration so you can keep them all straight! Q: When I push a feature from productboard to GitHub, nothing happens... but it works for my colleague. What's going on here? A: The user who set up the integration in productboard has to be a GitHub repository owner or organization admin. It is not yet possible to import GitHub issues into productboard as features using this integration. However, it is possible to use Zapier for a one-time import. It is not yet possible to link productboard features with existing GitHub issues. Links can only be made by pushing features from productboard to GitHub.